Detail is provided to enable the reader to implement concepts in software and, in addition, a collection of related computer programs are available via the Internet. 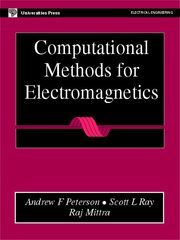 Computational Methods for Electromagnetics is designed for graduate-level classroom use or self-study, and every chapter includes problems. It will also be of particular interest to engineers working in the aerospace, defense, telecommunications, wireless, electromagnetic compatibility, and electronic packaging industries.